I spent the night in Gallup, New Mexico, It had been a long night of travel in the rain down US 491. Lots of road work and plenty of water crossing the road. I got a late start but decided to turn around and fill my gas tank and my belly tank. I pulled into a gas station and saw this man wiping down the bike. Looking closer I saw his hat. I had to talk to him. I spend a lot of time photographing US Veterans in and around Washington DC. 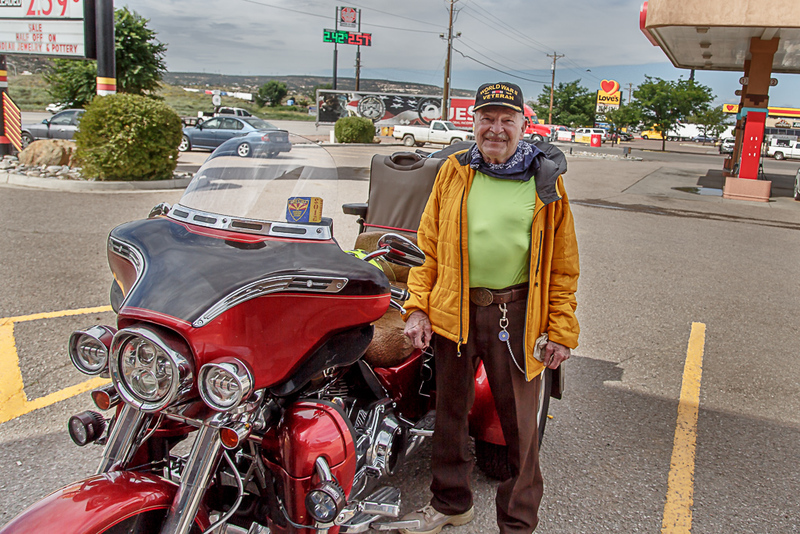 This was the first opportunity I had to photograph a WW II Veteran “in the wild” traveling on a Harley Davidson trike. A fun conversation for about thirty minutes and then we went our ways. Sometimes it pays to turn around. Thanks Harold Adams.